Published by Mountainblog on 05/29/2018 . 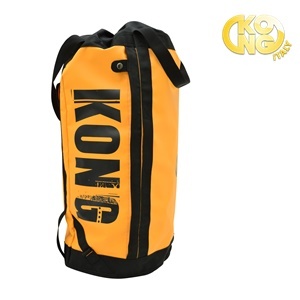 Bag for carrying ropes and equipment, with concealable, comfortable padded shoulder straps and removable wide lumbar support. Haul loops of different lengths for barycentric suspension. Wide opening for convenient access to the bag’s contents. Inner roll closure with aluminium buckle and external drawstring closure. Side opening equipped with an ultra-resistant size 10 nylon zip with a protective anti-rubbing flap and an automatic button that prevents accidental opening. Transparent side pocket to hold an identification tag. Internal removable pocket with zipper and textile loops for storing the smallest of tools. Made of extremely durable PVC. Reinforced bottom with wear-resistant edge. Double seams at the points of greatest stress. 50L capacity which is expandable to 60L. Optional backpack that can be fixed inside the bag OMNIBAG through dedicated attachments. Can be used as rope bag or for personal accessories to be stored separately. Opening with 270 ° double slider zip. Fixing loops with different colors for the ends of the rope. Internal pocket with zip for documents. 3 internal textile loops for fixing materials.